As I walked out of Fenway Park, I was exhausted. I had been on my feet for close to four hours, crammed into sec. 5 of the right field grandstand. In center field stood Bruce Springsteen and the E Street Band, defying age, adverse weather and local curfews, playing song after song at rapid fire, all the while running, jumping and working the audience into a frenzy. 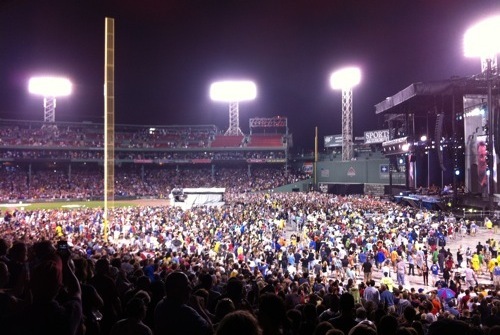 This was his second of two shows at the famous ballpark in support of his Wrecking Ball album. Reports were fabulous for the first night, with Springsteen covering the Rolling Stones, pulling out little-played favorites and carrying on for hours. And immediately, it seemed as though he was dead-set on topping the previous night. For those three and a half hours, I stood at my seat in barely controlled exhuberance, awed by this American music legend. But occasionally, the feeling crept in that, while this was amazing, this might actually be just another night at the office for these guys. While this might be among the most blazing, incredible concerts I’d ever attended, it might not even register in Springsteen’s internal top 100. After years of admiring and digesting his records, this was my first experience with Springsteen and the E Street Band live. I started to imagine what it must be to see this band every night. They were so good, I didn’t know how to process that thought. The band, more than I had realized, is a finely tuned machine, ready to turn on a dime and follow their eccentric leader’s every whim. Max Weinberg is a machine on the kit, face forceful and determined, staring and confident as he pushes the band through every change and jam. Steve Van Zandt and Nils Lofgren bend and weave as they’re needed, taking solos, stepping back or hopping on banjo or mandolin if called upon. Jake Clemons, on saxophone and part of a five-piece brass section, jumps to the front of the stage and fills in admirably for his fallen uncle Clarence Clemons, for so long the centerpiece of Springsteen’s backing band. As Springsteen called audibles, they whipped around and answered his call. He seemed to start it immediately, demanding “Hungry Heart” early, jumping into Eddie Cochrane’s “Summertime Blues” and “Girls in their Summer Clothes,” a rarely played song from 2007’s Magic. When Springsteen was taking requests from the crowd, he made his band play Eddie Floyd’s “Knock on Wood” for the first time. If he hadn’t said anything, it would appear they’d rehearsed it a hundred times. And Springsteen himself pulled off the song like a reincarnated Otis Redding. They can’t be stumped. There is no other band around like this. He also responded to the elements beautifully. As soon as the skies opened and the rain returned, he had the band jump into “Waitin’ on a Sunny Day.” The encore, which should be noted followed the main set so quickly that Bruce remained on stage, began with a solo acoustic version of “Who’ll Stop the Rain.” This is, obviously, a performer who has seen it all and still thrilled by what he does each night. But perhaps his greatest moment began the instant he stepped on stage. The entire evening was wrapped up in the opening number, “Thunder Road.” Springsteen, accompanied only by Roy Bittan’s piano, bookending the song himself with harmonica, stood solitary on the massive stage, singing with all the strength of the great soul men, bringing a crowd of more than 30,000 to its feet to sing every word of the chorus-free ballad. It was a tremendous display of musical power, this lone man instantly commanding the respect and awe of an audience so massive. And the words carried resonance beyond anything I expected. By the time the hero, looking to break the shackles of his seaside suburban life, reached the point where he was “riding out tonight to case the promised land,” I was on the verge of tears. I tried not to look any of my friends in the eye. The hair on my arm had stood on end the moment he began singing, but this was a level of emotion and joy I wasn’t expecting. That song, specifically, the solo version that kicks off the Live 1975/1985 set, has seen me through a number of crises, moments of personal turmoil quelled by a timely song in the car or in my headphones. It’s one of his biggest songs and to hear him play it in a stadium setting is no surprise. To hear him kick off this show with that song in that arrangement was nearly overwhelming. One look at the crowd was proof I wasn’t alone. The great concerts can have as few as one of these moments. This show started off with it, took that distillation of soul and carried it through three and a half hours of non-stop music, a veritable clinic of American rock and roll, soul and blues. Springsteen’s command of the American songbook is impressive enough, taking cues from the crowd and springing new numbers on the E Street Band at will. But it’s his own work that has made him a legend, and his otherworldly work ethic that has fueled this master of ceremonies. He’s coming up on his 63rd birthday next month, and he left the crowd gasping for air by the end of the night. If not for already having blown curfew by 40 minutes, he could have kept playing. I left Fenway Park spent. I walked down through the Back Bay Fens to the T, hopped on the Green Line, switched to Red at Park Street, and rode down to Quincy, where I had stashed my car on a quiet residential street. As I walked out of the station, I replayed as much of the night in my mind through a five-minute walk as I could. The jams, the covers, the call-and-response, the energy. As I walked, it was still raining. I was exhausted. I was still there.